Flash Point is a podcast devoted to gaming (with a bias toward MMOs), pop culture and anything else related we throw in. It is recorded monthly (or more regularly where needed). It’s hosted by David Holloway (Australia) and Simon Potter (Australia), with guest hosts popping in here and there. There’s always plenty of debate and community interaction. We have regular guests and have some competitions / giveaways as well. Got a question you’d like answered or a suggestion for the podcast? 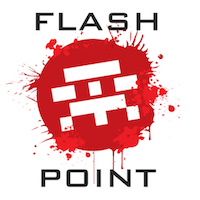 If you have a shout out you’d like read out at the start of the podcast, then just click the button below to pay your $10 and we’ll happily read any appropriate blurb of up to 100 words on the next episode of Flash Point. It’s fine to pimp a website, wish someone a happy birthday, or pretty much anything that’s legal and doesn’t have profanity in it. Please check out our details or other advertising options if you’re wanting something more substantive. All advertising profits after site expenses go to Kiva – check out what our team has donated already! If you like Flash Point, you may also like our other baby, We Hate People. It’s a broader pop culture and politics podcast where we gripe about topical stuff.